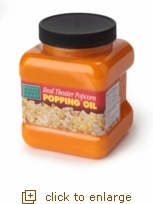 This is the same oil that is used by commercial popcorn poppers. The 15.25 oz jar is easy to handle because of its smaller, compact size. Also, check out our butter salt and popcorn selections to have a complete set of essentials for movie theater popcorn!